The Federal Government has announced $41 million of funding to kickstart the Australian space sector over the next four years. international space investment ($15 million for grants over three years). As expected, the funding establishes a national space agency, and ex-CSIRO head Dr Megan Clark is tipped to serve as the inaugural head. The surprise in the budget is the around $260 million investment in applying satellite data to Australia – mostly in precise positioning but also in satellite imagery. 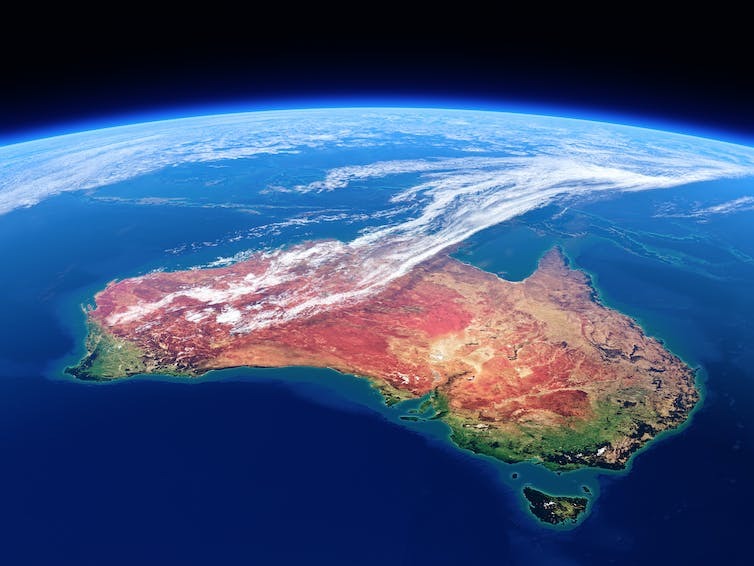 $36.9 million to improve “Digital Earth Australia”, a platform that assembles global satellite images of Australia in a user-friendly and publicly accessible way. This budget marks the first time Australia has had an official space agency, and puts an end to decades of Australian ambivalence towards civilian space. Timeline of key events in Australia’s space activities from 1957-2018: click on arrows at right and left to go back and forth. Adapted with permission from Kerrie Dougherty – this timeline first appeared in her review of Australia’s space activities in 2017. The emphasis on industry shows the agency’s mission is to enable the growing Australian space sector to strut its stuff on a global stage. The space industry is worth more than A$400 billion per year, and plays an increasingly vital link in civil and military activity. The government’s concept of a space agency is as an economic and national security play – it is not aimed as a catch-up attempt to lavishly funded international peers like NASA. With this budget, the government is trying to walk a fine line between enabling successful Australian businesses in the high-tech space game, and creating a sector dependent on government largesse. The $41 million over four years is about the minimum viable amount to start towards these goals. Sensibly spent, it is enough to achieve the core aims of an Australian agency. International credibility for Australian space: Australian space businesses bidding for international work dread the question “why doesn’t Australia have an agency?” as it’s often the prelude to “without an agency it’s just too risky for us to work together”. A funded agency takes this objection off the table and levels the playing field. Support for Australian business: Early-stage grants to help businesses prove concepts – for example, to build a launch-ready small satellite – are within the means of this budget. This will help Australian startups cross the “valley of death” from concept to export-ready, space-tested hardware. Federal and international coordination: A mix of state and federal agencies have a hand in civilian space activities; a funded agency will help impose order domestically and serve as a focal point for international engagement with other space agencies. Long term strategic planning for the sector: Space is a long lead-time business. The agency will be responsible for strategic planning for the sector. The money will give its plans clout and an ability to nudge startups and universities into growth areas through funding allocations. This is not the sort of funding for an agency that will be hiring engineers and building its own spacecraft. Most of the money will be spent in partnerships with commercial companies and universities to help get new ideas and good companies off the ground. Some will be spent with international agencies to give Australia a “seat at the table” and a chance to bid for international contracts. These partnerships are the likely role of the $15 million earmarked for space investment. what areas will Australia focus on? where will key parts of the agency be located? what will the future of the agency look like after the four years? I look forward to seeing these details in the near future. Australia’s Space Agency and its journey to the stars. More details on the federal government’s commitment to establish an Australian Space Agency are expected in next week’s budget. In his budget speech on Tuesday, Treasurer Scott Morrison is tipped to allocate A$50 million to help establish the agency. Former CSIRO boss Megan Clark will reportedly head the agency for its first year. She is chair of the Expert Reference Group, part of the government’s review of Australia’s space industry capability. Following a period of consultation, the group earlier this year delivered its final strategy to the government on how the agency should take shape. The campaign to get a space agency for Australia has been running for years, and has been extensively covered by The Conversation. Back in August 2013, Andrew Dempster, director of the Australian Centre for Space Engineering Research UNSW, highlighted the problem, arguing there was a hole in the Australian public administration where a space agency should be. He pointed to a 2009 Senate report that noted then that Australia was the only Organisation for Economic Co-operation and Development (OECD) country to lack a space agency. Dempster outlined ten reasons why he and others believed Australia needed a space agency. Apart from helping to secure funding, and giving Australia access to other space agencies, one of the key arguments was to keep our space experts and engineers in Australia. The absolute best Australian students are being attracted to space at the undergraduate level, and goals like that will provide them with somewhere to work – here. So there are plenty of reasons to establish a space agency – otherwise, Australia will remain “lost in space”. A year later, in July 2014, Dempster and UNSW colleagues Barnaby Osborne and Elias Aboutanios argued again the lessons that could be learned from the UK’s space agency. They highlighted the pressure from space industry leaders for better UK government support, and a goal to capture 10% of the global space market. The UK Space Agency was eventually established in 2010 with an ambition to meet that 10% target. If the UK can do it, why not Australia? But just how much of the global space market does Australia have? Australia has so far captured only about A$1.2 billion or just 0.37% of the existing market. Clearly more needed to be done if Australia was to improve on that share, hence the need to look to the UK’s case for ideas on how to gain government support for a space agency here. In September last year the federal government finally said Australia would get a space agency. Senator Simon Birmingham made the initial announcement in front of thousands of international delegates at the International Aeronautical Congress in Adelaide. This announcement has the potential to be monumental, and great reward for people (including me) who have fought for an agency for many years. …the long-term sustainability of a space industry in Australia will critically depend on the availability of local talent, steady supply of expertise, and the manufacturing and technical skills required to bring Australia to space. 4. What sort of space agency? So a commitment was made to an Australian space agency. But what sort of space agency did people want? The Expert Reference Group was taking submissions and plenty of people and organisations were prepared to have their say on future role of the agency. My five steps to an effective agency are: include both “new” and “old” space, give the agency actual power, make the most of the space “brain drain” and work cooperatively with the Department of Defence. He said space was already attracting investment with Venture capital funding and a number of small businesses already focused on the space sector. But he too was keen to see an agency help retain Australia’s space experts, and see a return of the wealth of Australians who have gone overseas to pursue space careers. One of the issues still to be resolved is where any space agency would be based. Andrew Dempster, from UNSW, and Alice Gorman, a senior lecturer in archaeology and space studies, at Flinders University, picked up the argument. People probably are thinking it will be something like NASA, with a whole industrial complex. We’re not anything like that scale. Having said that, a Canberra-based headquarters supported by state-based centres makes a lot of sense. In terms of location, I agree there will need to be an administrative presence in Canberra, to interact with the Federal Government. Other satellite sites should reflect where the action is. If there are to be satellite offices, they need to be close to where the industry is currently active, and where it is developing. This may require some sort of representation in each state. There are still plenty of unknowns at this stage and it’s hoped that further details will be revealed once the funding for the space agency is confirmed in Tuesday’s budget. The Conversation will continue to bring you expert reaction and analysis once those details are known, so watch this space (sic). We’re all waiting to hear what shape Australia’s Space Agency will take. It’s been a long time coming, but Australia is finally going to have a Space Agency. This will enable Australian space industries to benefit from agency-to-agency agreements and collaborations, and facilitate our participation in the growing global space market. The Federal Government appointed an Expert Review Panel to map out how the Agency should operate. As we wait for its report – the final strategy was scheduled to be submitted in March 2018 – two space experts offer their perspectives on what we might expect. What will an Australian Space Agency need in terms of people, resources and infrastructure? It seems clear there is a real appetite on both sides of politics for an agency for our times, that embraces the excitement being generated by “Space 2.0” – that is, commercial entities, low-cost access to space and avoiding some of the baggage of the older legacy agencies. It’s likely the focus will be on growing the Australian space industry, with less emphasis on space exploration, human space flight and space science. However, for the agency to have any impact or credibility, the people, resources and infrastructure must be provided at an adequate level. I have in the past pointed to the UK agency as a good model – it basically cost “nothing” initially and significant funding followed when it succeeded. Now, I don’t think we can afford to replicate this in Australia. The agency needs to be properly funded from the beginning. Penny-pinching will kill it. We’ve been here before and seen how a lack of resourcing plays out. The 1980s Australian Space Board was managed by a small office within the Department of Industry, Technology and Commerce, but it fizzled out after ten years and we were back to square one. There’s a strong feeling in the Australian space community that a substantial investment in a stand-alone agency is the only way to avoid another death by bureaucracy. In terms of personnel, we’ll need leadership with credibility and experience in the global space arena, people familiar with how existing space activities across government departments work, and probably there’ll be a role for some kind of advisory or expert panels. The structure will also be important. NASA, for example, runs 11 research centres, and the European Space Agency has nine centres or facilities, including the Kourou launch site in French Guiana. They support human spaceflight programs as well as deep space exploration. Both organisations use private contractors, and large chunks of the private space sector rely on them as clients. This is not a model that Australia can sustain. Personally, I think it’s critical that the new agency also takes Indigenous interests on board. Indigenous people can’t be left out of conversations about the future of Australian space technologies. How strongly should the Space Agency be linked with Defence programs? Recently the Australian Strategic Policy Institute argued that we must develop a solid space industry for our own strategic and Defence needs. However, strong industries such as that in the US have a dominant civilian space sector. So I would argue that to avoid this strategic weakness, it is more important to reinforce the independence of the civilian agency from Defence. It is the job of the agency to ensure this independence. Being overly close to Defence is likely to hamper the current civilian commercial drive so effectively being driven by the start-up community. Having a thriving civilian space sector can only benefit Defence anyway. I agree with Andrew that forging a new civil and commercial space identity is essential. Because the Woomera rocket launch site, one of our most significant space assets, is located in South Australia, as well as the Defence Science and Technology Group – which grew out of the Cold War weapons program – South Australia has traditionally been the focus of Defence-related space activities. A recent rocket launch from Woomera, South Australia. At this stage we can be hopeful that a properly funded space agency will allow equal participation across all states. Where should Australia’s Space Agency be located? There’s interest in where the agency will be located because there will be jobs associated with it. I’ve had so many enquiries from acquaintances – and strangers – asking about this. I’ve written a lot about Australia’s space agency, and recently I outlined an example of why a federal approach is essential: using space assets to monitor the Murray Darling Basin to avoid water theft. Senator Kim Carr’s recent announcement of Labor’s policy of several hubs and centres lends itself very well to distributed activity around the country. Bipartisanship on that issue would be very helpful. Which Australian states have relevant space capabilities right now? I live in South Australia, so am naturally well acquainted with this state’s space achievements! A number of exciting new start-ups such as Fleet, Neumann Space and Myriota are based in Adelaide. The South Australian Space Industry Centre funds space accelerator and incubator programs. Every year, we host the International Space University Southern Hemisphere Space Studies Program. A sports car and a glitter ball are now in space – what does that say about us as humans? The three universities in South Australia have strengths in satellite telecommunications, space law and space heritage. At the international level, South Australia has been developing relationships with the French national space agency (CNES), as well as French aerospace industries. I am from NSW so I have a particular interest in the NSW Department of Industry submission to the expert review panel. It suggested “the future Australian Space Agency should be based in NSW” and goes on to list 17 reasons why NSW dominates in space, such as having the largest space workforce, revenue, research effort, number of start-ups, venture capital and law presence. The only centre funded by the Australian Research Council on space is in NSW, and two of the four satellites built and launched last year involved my university. However, I don’t believe there is any benefit to highlighting one state over another. I’m with Raytheon Australia, whose official position is that state rivalry for Defence work is getting “hysterical” and we should be avoiding that with space work. Really exciting things are happening in space all over Australia. Australia’s launch company Gilmour Space Technologies operates out of Queensland. A lot of space start-ups are being nurtured by Moonshot X in Victoria. Western Australia boasts the Desert Fireball Network and the only Australian picosat (small satellite) developer, Picosat Systems. The ACT hosts the large testing facility, the Advanced Instrumentation and Technology Centre. Back in 1958, the beginning of the Space Age, Australia was one of the founding members of the United Nations Committee on the Peaceful Uses of Outer Space. We’ve been kind of missing in action ever since. The new Space Agency will allow us to have a credible voice on issues that may impact Australia – such as revisions to the international space treaties. It’s going to be exciting times ahead! What will it take to give Australia’s space agency wings? Image from the opening ceremony at IAC2017. Senator Simon Birmingham’s September declaration that Australia would establish a space agency created a buzz across the space sector. The announcement was unexpected. Few anticipated any government commitment until after Dr Megan Clark’s expert panel reported on Australia’s space industry capability in March 2018. Establishing an agency is a sensible decision and rightly has bipartisan support. But the hard work in determining the shape of the agency has only just begun. Read more: Yes, Australia will have a space agency. What does this mean? In forming the new agency, much has already been said about what it might do. But how the agency is set up will be just as important to success. The most startling recent evolution in space is that there is more money on the table. Venture capital funding for space projects in each of 2015 and 2016 exceeded the total of all venture capital investments in space since 2000. Australia has more than 43 small businesses focused on the space sector. This growth has been driven by a rapidly falling cost to participate in space activities. The cost and weight of satellites has plummeted as the technologies that deliver small, affordable smartphones found space applications. Innovation, competition and ride-sharing on launch vehicles – think Elon Musk’s Space X and Auckland-based startup Rocket Lab – have reduced per-kilo prices to space, and costs will likely fall further. In this rapidly changing environment, here are my five recommendations for space agency success. The “new space” market is characterised by projects focused on commercial return, particularly small satellites. This is a fast growing sector with existing companies that can deliver Australian technology jobs and export revenue. To make the most of this existing pool of potential, the agency should fund widely with small amounts, just enough to prove concepts or encourage commercial participation. It should draw on venture capital in assembling this portfolio, as the CSIRO and the UK Space Agency are doing. Despite the hype around small satellites and commercial space, Australia should not neglect altogether the “old space” of large, reliable and expensive satellites. These are still the mainstay of the industry, and the training ground from which many startups spring. Precisely because the work proceeds more slowly, old space offers steady cash flow to complement the precarious financing arrangements of many of the new space businesses. New space companies that can also sell hardware or services to old space companies are particularly valuable. The path here is clear: the agency should work closely with existing trade programs to help the Australian space industry break into global supply chains, in particular helping business navigate restrictive foreign export and labour laws. Images such as this one collected by NASA’s Suomi NPP satellite can be used to detect bushfires in remote Australia. It is not enough for the agency to develop a paper vision for the Australian space sector; it needs the power to make it a reality. Historically, Australia’s civilian space strategy has been fragmented by a bureaucratic turf war across agencies including CSIRO, the Bureau of Meteorology, Geoscience Australia and the Department of Industry. Now state and territory governments are joining the fray. South Australia recently launched a Space Industry Centre, and in October Australian Capital Territory Chief Minister Barr visited SpaceX and other aerospace giants on the US West Coast “to discuss opportunities”. Australia’s agency needs the authority to impose national strategic discipline. The government could give the agency undisputed policy authority, for example, by making it a small group within Prime Minister and Cabinet. Or the agency could be given purse-string power by allocating the civilian federal space budget through it rather than the existing patchwork of agencies. Anything less will make the agency a contested and ineffective leader for the Australian space sector. 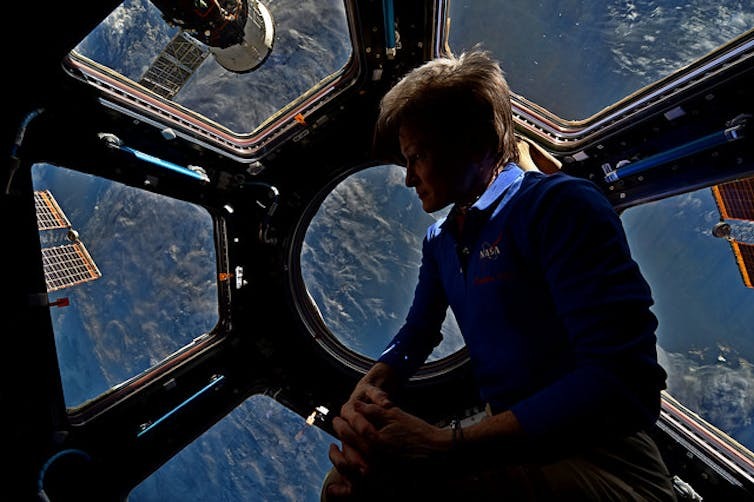 There is a wealth of Australians who have gone overseas to pursue space careers. Many were back home for September’s International Astronautical Congress in Adelaide, and were keen to contribute to the success of the agency. The federal government should be flexible enough to include these dynamic individuals and accelerate the first years of the agency. For example, somebody like Christopher Boshuizen, the Australian co-founder of space startup Planet – on the path to “unicorn” US$1 billion valuation – would be a great asset working on behalf of Australian space startups. Such talent would kick-start the late-blooming agency with world-class credibility and instant connections to global activity. A civilian space agency needs to establish a relationship of mutual respect with the Department of Defence space sector, while each maintains primacy in its own sphere. Defence has substantial space experience, both directly and through Australia’s US alliance. And investments in national security space dwarf civilian spend. For example, Defence recently announced a decade-long program worth A$500 million to develop domestic satellite imagery capabilities. With the right relationship, Defence would increase access to the agility and innovation of the commercial sector and the civilian agency would benefit from the experience of Defence personnel. As Senator Birmingham announced Australia’s plans to the world’s largest civilian space conference (September 2017’s International Astronautical Congress), he was speaking to many who have lived through Australia’s big talk on space. We’ve experienced failed launch proposals on Christmas Island and Cape York, and the rise and fall of the Hawke government’s “Australian Space Office”. Birmingham made an announcement on the biggest possible stage. The “how” will be as important as the “what” if we are to make good this time on high expectations. In the 1950s, Australia was actively involved in the space industry via collaboration with other space players, including the UK. A stronger space industry would benefit Australia’s economy, generating more exports and creating more job opportunities. Australia is well placed to expand its industry, particularly with the announcement of a new national space agency. The government should actually aim to establish a national space policy as part of this announcement. That way it can secure the future of this industry. In the 1950s, Australia was actively involved in the space industry via collaboration with other space players, including the UK. However, this started to decline since the late 1960s because of the depression and huge cost of space programs. According to the current IMF statistics, Australia now ranks the thirteenth in the world in terms of its GDP output, but still spends very little on developing its space industry. So it’s not surprising that the industry is now underdeveloped. Though the international space industry generates about US$400 billion a year, Australia contributes only 1% to this figure. Australia could create more exports in the space industry by developing its own capability to launch satellites and taking more control of data and information acquired through satellites. The data Australians use every day is now provided by international satellites and overseas corporations. Every year in order to collect information about earth from space, Australia pays about A$5.3 billion to the overseas satellite corporations. Australia’s space industry currently employs up to 11,500 people. The plan to establish a national space agency could boost these numbers. Beyond job opportunities for engineers and technicians in space launch services and satellite manufacturing, the industry also needs a great variety of specialists in other areas. For example, as a part of space industry supply chain, chemists are in demand to develop greener rocket fuel. The space industry even requires lawyers. The international community has established an international treaty regime regulating space activities and as a part of this Australia has accepted various obligations. So the government and companies will need to access professional legal advice to ensure they aren’t violating Australia’s obligations under international space law. There are more job opportunities than just astronauts, engineers and technicians in the space industry. In the context of manned space programs, Australia could also develop medical professionals who could be recruited to research the space environment’s impact on human bodies, as NASA has done in the US. Australia has a geographical advantage when it comes to being a leader in space industry. From the perspective of physics, the closer the launch site is to the Equator, the heavier satellite the rocket can carry.. That’s why the US has its Kennedy Space Centre in Florida. In terms of Australia, the Northern Territory’s close proximity to the Equator makes it an ideal rocket launch site for space missions. Perhaps this is why the NT government has shown interest in developing a space industry in the state. In fact, a few state governments have been part of the push to develop a stronger space industry. South Australia and ACT were lobbying for a national space agency earlier in 2017 and the NT recently joined this push. This could have inspired the federal government to do more to be a national leader in developing space industry. Given the technology-intensive nature of space industry, talent is very important for sustainable success. A number of Australian universities have conducted either their own space research projects or with overseas partners. This sort of research has fostered a large team of space specialists. In addition, state governments, have also discussed space technology collaboration with foreign governments. For example, the South Australia government held talks with the French government on developing more talent in preparation for a growing space industry. Given Australia’s big size and its reliance on space technology and service, it’s important for the nation to establish its own stronger space industry to meet its needs. Australia has a few advantages in developing this and a national space agency will definitely be a boost to this aim. A space agency will allow Australia to sit at the table with NASA, ESA and other global agencies. In front of an expectant audience of more than 4,000 international delegates attending the International Aeronautical Congress in Adelaide, today Senator Simon Birmingham – representing Minister for Industry, Innovation and Science, Arthur Sinodinos – announced Australia’s federal government is committed to a space agency. Although details on timelines, funding and practicalities are yet to be described, here three experts address the question of how an Australian space agency will support the sector. Interestingly, the announcement preempts the report of the government’s Review of Australia’s Space Industry Capability, which is due in March. The roundtable events in support of this review have resoundingly supported establishment of an agency, with most of the effort dedicated to its role and structure. We are still awaiting detail of how such an agency would look. What is critical is that the agency is not simply a replica of the earlier Space Policy Unit, and Space Coordination Office. These were small offices primarily focused on policy and the workings of government. The real opportunity an agency offers is the growth of the local industry to the point where it is sustainable and can deliver big projects – Australian solutions to Australian problems: i.e. it is about Australian sovereignty. To be successful in that regard, commitment to a space agency cannot be halfhearted. It must be resourced with the right quality and quantity of people to deliver a vibrant Australian industry. Once that is achieved, and the benefits become obvious, we’ll all be asking why we didn’t do it decades ago. Details about the structure and brief of the announced future National Space Agency are not known at present. Ideally, an Australian space agency should oversee the coordination and development of the entire space supply chain. Right now, the quality and impact of Australian space research is demonstrably well above the size of its scientific and aerospace engineering community. This fertile scientific and technological environment has encouraged many young startups revolving around space technology and space data. Access to space is therefore crucial to ensure the sustainable growth of this nascent industry. This can only happen under the purview of a dedicated Australian agency, tasked with the coordination of all civilian space related activities in the country, with the delegation to allocate and distribute resources, and to represent and facilitate Australian interests internationally. The present focus is on the many possibilities of economic growth and industrial development. But the long-term sustainability of a space industry in Australia will critically depend on the availability of local talent, steady supply of expertise, and the manufacturing and technical skills required to bring Australia to space. This requires strong and continued support for STEM education, investment in space science and technology, research and training. An Australian space agency would therefore be responsible for all space-related activities. There may be concerns that such portfolio may require the institution of a new giant bureaucracy. This need not be so, if the future agency is structured in a way that captures the expertise of the many groups and individuals already working in space-related fields all over Australia. This announcement is exciting not just for Australian space industry, but also for future generations in Australia and for the global space industry. Michael Davis, Brett Biddington and others – who are responsible for bringing the International Aeronautical Congress to Australia – have shown that industry can and will lead. Australia rates very highly in space startups per capita: these are not big, multinational companies, but small enterprises making an disproportionate contribution in niche areas. The Australian space agency will have a regulatory role, obviously, but it needs to do what the industry can’t do for itself. It needs to represent the Australian people at home and abroad, it needs to pursue Australia’s interests in global space governance bodies, it needs to not only help seize opportunities for Australia but actually create opportunities and it needs to be a focal point internally and externally. Perhaps most importantly, it needs to facilitate collaboration by the many government agencies, plus the academic, research and other civil institutions and the growing number of commercial enterprises involved in space in Australia. It also needs a strategy that identifies some enduring, national “beacon” projects to muster the immense energy in the Australian space industry right now and which will herald our place in space. This, and more, is what we hope to hear about in the next few days, or at most, months. Australia worked closely with the UK, Europe and USA in developing space capability in the 1950s and 1960s. The eyes of the world’s space expertise will be on Australia this month, as Adelaide hosts the world’s largest space conference. The meeting occurs in the 50th anniversary year of the launch of Australia’s first satellite, WRESAT. This project occurred as the culmination of a decade in which Australia was seen as a significant player in the space arena. But now, Australia is perceived to be underperforming in the space sector. It remains one of only two OECD countries not to have a space agency (the other nation is Iceland). So what happened in the past half century to slow us down? My doctoral thesis is attempting to find the answer. Australian involvement in space activities commenced with participation in the International Geophysical Year (IGY), a global scientific research program focused on understanding the Earth’s relationship to its surrounding space environment. Longer than a calendar year, the IGY ran from July 1, 1957 to December 31, 1958, and was a significant catalyst for space-related activities in many nations. In mid-1955, the USA and the USSR had both announced their intention to launch a satellite during the IGY. 1955 American announcement of plans for the building and launching of the world’s first man-made satellite, under President Eisenhower. The then Presidential press secretary James Hagerty is shown with five scientists. 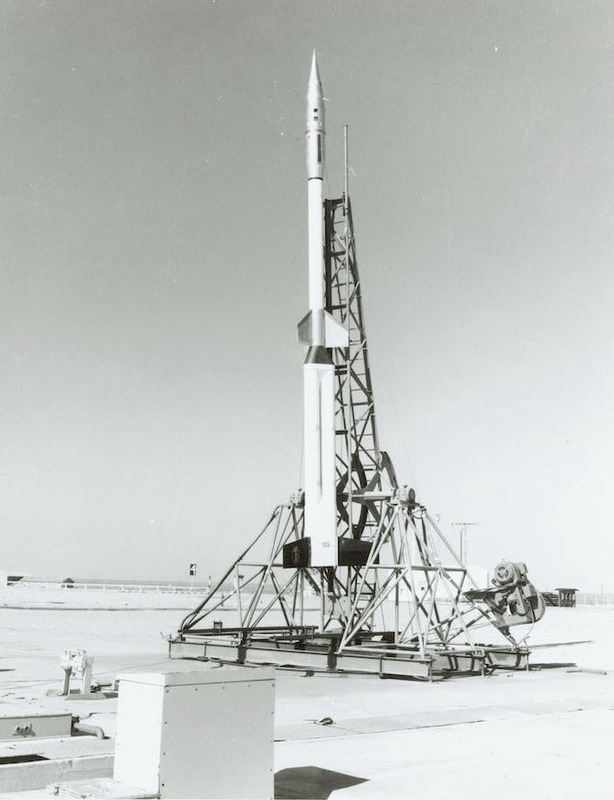 In that same year, Britain and Australia’s Weapons Research Establishment (WRE) announced their IGY plans to launch sounding rockets for upper atmosphere research from the WRE-managed Woomera Rocket Range. Located in outback South Australia, the range had been established in 1947 under the Anglo-Australian Joint Project as a guided weapons development and test facility. 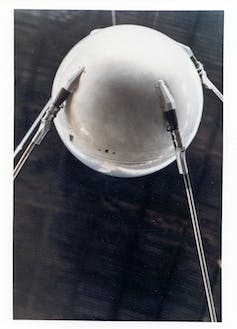 A mockup of the world’s first satellite, Sputnik. The decision to launch “sounding” (sub-orbital measurement-taking) rockets there for the IGY, coupled with US plans to launch the world’s first satellite, would lead to Woomera becoming the hub of early space activities in Australia. The “space age” truly dawned in October 1957, with the surprise launch of the USSR’s Sputnik 1 satellite beating the US into orbit. A space race between the two Cold War superpowers commenced, with Australia poised to participate in the openly scientific and covertly military adventure of space exploration. 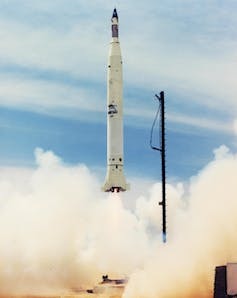 Britain’s Skylark sounding rocket program (1957-1979) would become the longest-operating space project at Woomera, launching British, Australian, European and American scientific instrument packages. Australian and British researchers made substantial contributions to X-ray, infra-red and ultra-violet astronomy using Skylark rockets. 8.2m in length, Long Tom was the first Australian sounding rocket. Although the WRE’s first sounding rocket program was unsuccessful, the development of the Long Tom rocket in 1958 paved the way for a succession of Australian sounding rockets operating until 1975. This program, conducted in conjunction with the University of Adelaide, carried out upper atmosphere research that made important contributions to understanding the factors governing Australia’s meteorology. Australia was also ideally located, geographically and politically, to host facilities for the two networks planned to track America’s proposed satellite, Vanguard. These were: Minitrack (a radio-interferometry system), and the Smithsonian Astrophysical Observatory’s Baker-Nunn optical tracking telescope cameras. Project Moonwatch volunteers, mostly amateur astronomers, supported the Smithsonian Astrophysical Observatory’s work by spotting faint satellites and establishing their orbital co-ordinates so that the observatory’s high precision camera could be then be focused on the satellite. Australia boasted five initial Moonwatch groups (Sydney, Melbourne, Adelaide, Woomera and Perth) – the first citizen scientists of the Space Age. When NASA was formed in July 1958, it assumed control of these original tracking stations. By 1970, Australia was home to the largest number of NASA stations outside the USA, hosting facilities for its orbital satellite, “manned” space flight and deep space tracking networks. These facilities, managed and staffed by Australians, made significant contributions to the early exploration and utilisation of space, particularly the Apollo lunar program. Television coverage of Armstrong’s first steps on the Moon came to the world through the NASA Honeysuckle Creek tracking station in the ACT (with the rest of the television during the Apollo 11 mission relayed via the CSIRO’s Parkes Radio Telescope). 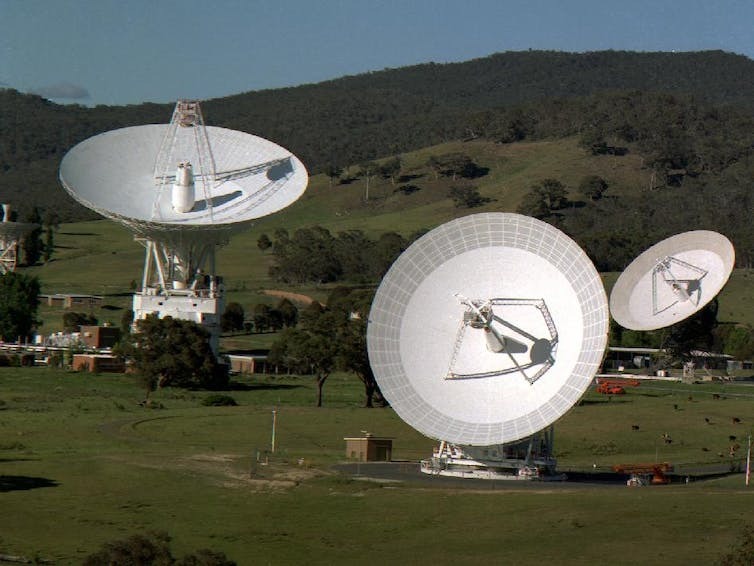 Although advances in technology eventually rendered most of the Australian tracking stations obsolete, the NASA Deep Space Communications Complex at Tidbinbilla, near Canberra, continues to play a major role in the exploration of the Solar System. It was the station responsible for monitoring the final hours of the Cassini mission to Saturn, which concluded with the spacecraft’s death-dive into the planet’s atmosphere on September 15. The Canberra Deep Space Communications Complex is part of NASA’s Deep Space Network. Defence-related space research commenced at Woomera in 1958 with the Black Knight and Jabiru programs. Investigating nuclear missile warhead design, materials and re-entry phenomena, defence research programs continued until just before the termination of the Joint Project in 1980. Particularly important to the Australian space story was the US-led SPARTA Project (1966-67): the generous donation of a spare launch vehicle from this program enabled the launch of WRESAT (Weapons Research Establishment Satellite), Australia’s first satellite. 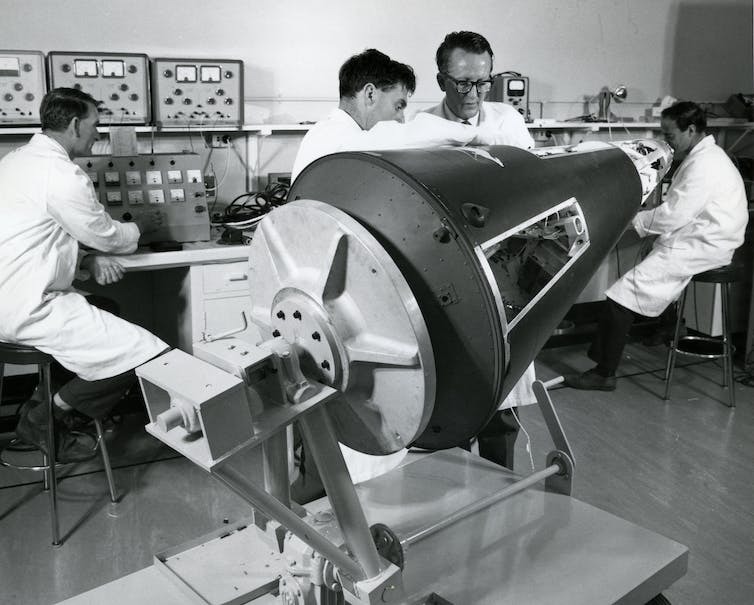 The WRESAT satellite under construction in a WRE laboratory. With a launch vehicle available, WRESAT was designed, constructed and launched in only eleven months: a significant achievement in itself. A collaboration between the WRE and the University of Adelaide, WRESAT’s scientific instrument package was derived from the Australian upper atmosphere sounding rocket programs and helped to corroborate their findings. Launched on November 27, 1967, WRESAT gave Australia entry into the exclusive “space club” of countries that had orbited a national satellite. WRESAT was launched from Woomera in 1967. At the end of its first decade of space activity, Australia had launched its own satellite, while a Melbourne University student-built amateur radio satellite awaited launch in the USA. The WRE had an active scientific sounding rocket program, participated in defence space projects and was supporting the European Launcher Development Organisation’s (ELDO) satellite launcher test program at Woomera. The country was a crucial participant in NASA space programs, through the tracking stations in the country, and an Australian (Dr David Forbes Martyn) chaired the UN Committee on the Peaceful Use of Outer Space’s Scientific and Technical Subcommittee. To build on these achievements, in 1968 the WRE proposed a modest national civil and defence space program, which could have harnessed WRE and civil space capabilities towards the development of an Australian space industry. The proposal was rejected by the Gorton government on the basis of cost. 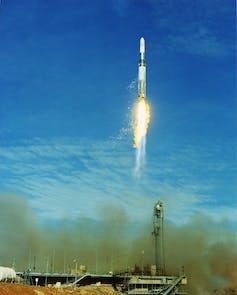 An ELDO Europa rocket launched from Woomera. This marked the beginning of a cyclical process that has, at least in the civil sector, hindered Australia’s ability to maintain its original level of space capability, or redevelop it over recent decades. Political parties of both persuasions have shown shortlived, underfunded, bursts of support for developing an Australian space industry, only to withdraw that support just as these programs were achieving results. Potentially beneficial membership of the European Space Agency (the European Launcher Development Organisation’s successor), to which Australia has been repeatedly invited, has been constantly rejected, also (ostensibly) on the basis of cost. Timeline of key events in Australia’s space activities: click on arrows at right and left to go back and forth. The reluctance of successive Australian governments to support national space activities and a national space industry has been something of a puzzle, especially given the country’s reliance on space-based services. My PhD research has sought to find the answer to this question within the first two “boom and bust” decades of Australian space activity. So far, no clear answer has emerged, apart from claims that “it’s too expensive”. 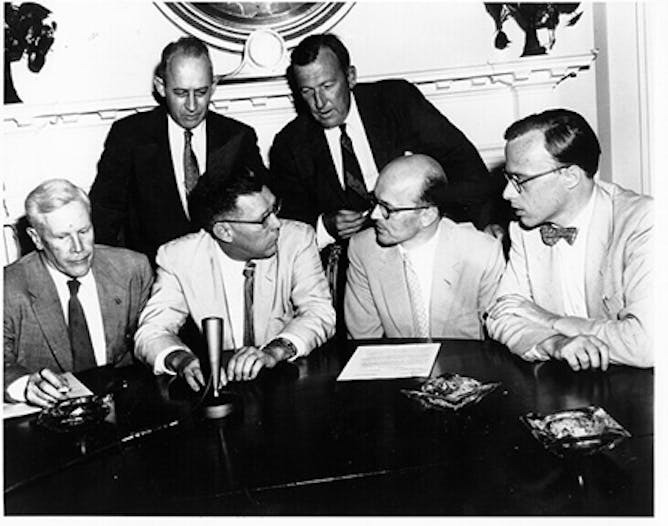 While an economic case could perhaps be made for rejecting a 1959 Australian National Committee on Space Research proposal for a national science program – given that Australia was then in recession – the 1968 WRE and 1970 Australian Space Research Agency space program proposals were both put forward during periods of economic prosperity. Their proposed costs represented very small fractions of GDP, and could have been affordable. These early space program proposals had modest proposed costs, and reflected modest goals of developing a national capability in an important emerging technology. However, there seems to have been a perception in government that committing to a space program, and/or a space agency, meant committing to high-cost ventures such as human spaceflight (which were admittedly beyond Australia’s economic means at the time). This unnecessary assumption, which was overtly expressed in the activities that were specifically ruled out of the 2013 Australia’s Satellite Utilisation Policy, has continued to bedevil proposals for the development of national space capability. I find it hard to accept that, as one previous article in The Conversation has suggested, the “intense pragmatism” of Australian governments has left them content to allow other nations to control Australia’s access to space. As early as 1960, the government clearly recognised the value of space applications to the management and economic development of the vast continent of Australia, and to its national security. 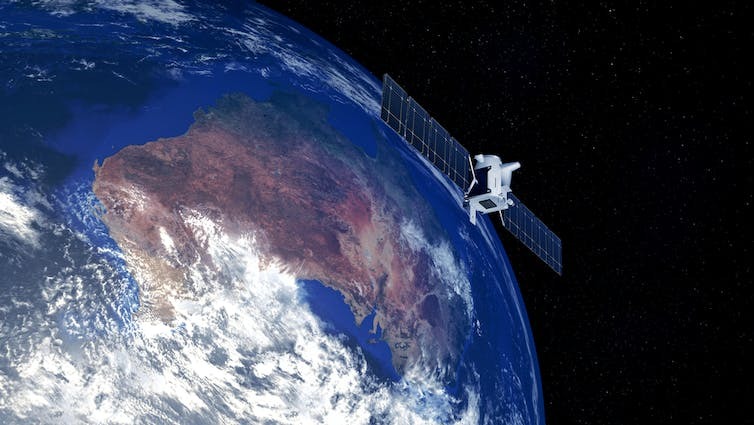 Australia became an early adopter of satellite technologies and is well recognised today as a sophisticated and extensive user of space-based services and space-derived data. Until the economic rationalism of the 1990s, the development and management of national infrastructure was seen as the responsibility of government. Why, then, was the “orbital infrastructure” of satellite networks on which the country came to rely, not also considered a responsibility of government in earlier decades? Is it pragmatic to allow other nations, even if they are allies, the ability to control Australia’s access to vital space-based services? Engagement in overseas military actions since 1990 has already taught the Australian Defence Force the importance of having control of its own satellite communication assets. In late 2015, the government commenced a review of the Space Activities Act, which has been seen as hindering the growth of the New Space sector in Australia. Growing calls from the space national space community for a space program and space agency have also this year prompted the 2017 review of Australia’s space industry capability. Will the outcome of these two reviews be the revival of Australian space activities, at a level to equal or surpass our space engagement of half a century ago. Or will the nation continue to remain “lost in space”? Perhaps an announcement during the 2017 International Astronautical Congress will tell. 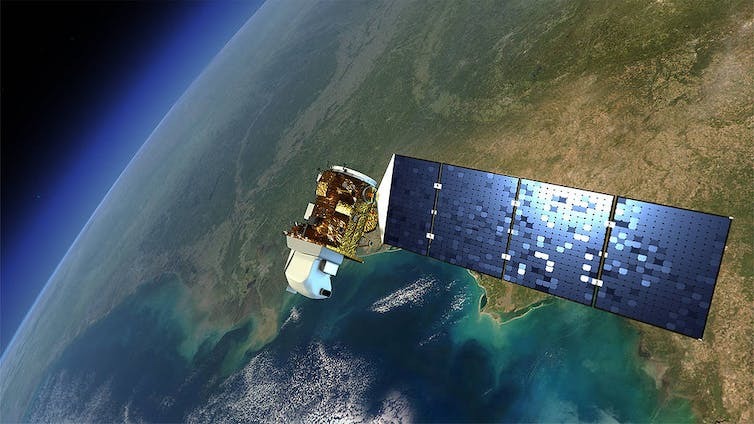 The NASA satellite Landsat-8 collects frequent global multispectral imagery of the Earth’s surface. This article is part of a series Australia’s place in space, where we’ll explore the strengths and weaknesses, along with the past, present and the future of Australia’s space presence and activities. Rockets, astronomy and humans on Mars: there’s a lot of excited talk about space and what new discoveries might come if Australia’s federal government commits to expanding Australia’s space industry. But one space industry is often left out of the conversation: Earth observation (EO). EO refers to the collection of information about Earth, and delivery of useful data for human activities. For Australia, the minimum economic impact of EO from space-borne sensors alone is approximately A$5.3 billion each year. And yet the default position of our government seems to be that the provision of EO resources will come from other countries’ investments, or commercial partners. This means the extensive Commonwealth-state-local government and industry reliance on access to EO services remains a high-risk. 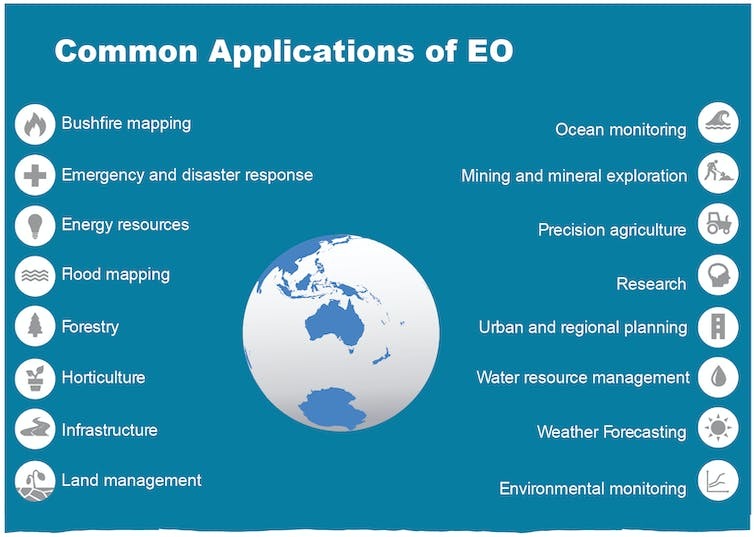 What is EO (Earth observation)? You’ve almost certainly relied on EO at some point already today. 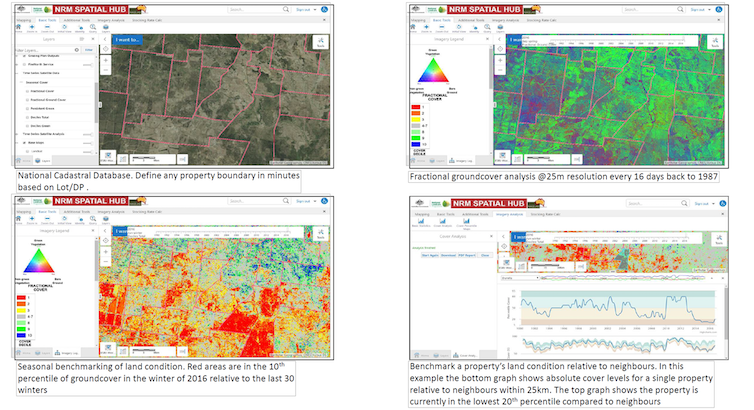 The wide range of government, industry and societal uses of Earth observation in Australia. EO describes the activities used to gather data about the Earth from satellites, aircraft, remotely piloted systems and other platforms. It delivers information for our daily weather and oceanographic forecasts, disaster management systems, water and power supply, infrastructure monitoring, mining, agricultural production, environmental monitoring and more. Global positioning and navigation, communications and information derived from satellites looking at, and away from Earth are referred to as “downstream” space activities. “Upstream” activities are the industries building infrastructure (satellites, sensors), launch vehicles and ground facilities for operating space-based equipment. In this arena, countries such as Russia focus on building, launching and operating satellites and space craft. Others (such as Canada, Italy, UK) target developing industries and government activities that use these services. The US and China maintain a balance. Although we rely so heavily on downstream space activities in our economic and other operations, Australia invests very little in space: only 0.003% of GDP, according to 2014 figures. Other countries have taken very proactive roles in enabling these industries to develop. Most government space agencies around the world invest 11% to 51% of their funds for developing EO capacity. These investments allow industries and government to build downstream applications and services from secure 24/7 satellite data streams. Historically, Australia has invested heavily in research and research infrastructure to produce world leading capabilities in the science of astronomy, space-debris tracking and space exploration communications. we have a well organised EO community across research, industry and government, with a clearly articulated national strategic plan to 2026. Example of an information delivery service built from Earth observation data streams to deliver property level information to graziers and others land-holders (click to zoom for a clearer view). EO plays a vital role in many aspects of Australian life. Australia’s state and Commonwealth agencies, along with research institutions and industry have already built essential tools to routinely deliver satellite images in a form that can be developed further by private industry and delivered as services. But our lack of a coordinating space agency adds a layer of fragility to vital EO operations as they currently stand. This places a very large amount of Commonwealth, state and local government activity, economic activity and essential infrastructure at risk, as multiple recent national reviews have noted. Our federal government started to address the problem with its 2013 Satellites Utilisation Policy, and will hopefully build on this following the current rounds of extensive consultation for the Space Industry Capability Review. Although our private EO upstream and downstream industry capabilities are currently small, they are world leading, and if they were enabled with government-industry support in a way that the Canadian Space Agency, the European Space Agency/European Commission and UK Space Agency do, we could build this sector. If Australia is to realistically participate in the “Space 2.0” economy, we need to act now and set clear goals for the next five, ten and 20 years. EO can be a pillar for this activity, enabling significant expansion of our upstream and downstream industries. This generates jobs and growth and addresses national security concerns. That should be a win for all sectors in Australia – and we can finally give back and participate globally in space. Data sources for figure “Proportion of space budget spent on different capacities”: NASA; ESA – here and here; JAXA; PDF report on China. Standard and Poor’s Global reaffirmed a negative outlook and is questioning the government’s projection about when the budget will return to surplus, but has still maintained Australia’s AAA credit rating. The agency’s maintenance of the AAA credit rating following last week’s budget will be a relief to the government, but its detailed outlook is less than confident. The initial negative outlook from the agency was made in 2016. In continuing it, it points to “risks to the government’s fiscal consolidation plan and risks to the economic, fiscal, and financial stability outlook should the rapid growth of credit and house prices continue”. The budget projects a return to surplus in 2020-21. But S&P Global says it continued to think surpluses “could remain elusive beyond fiscal 2021”. 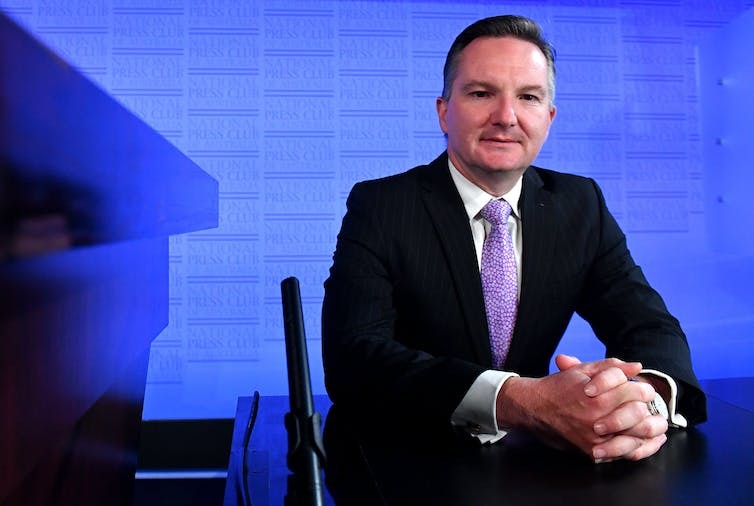 “We will continue to assess the likelihood or otherwise of whether the government will reach a balanced or surplus budget by 2021 and that will have a large bearing on whether we leave the AAA rating where it is or whether we downgrade it,” he told the ABC. The S&P Global report cites the potential for low wage growth and low inflation as a “downside risk” for the projections on getting to budget balance. In the wake of the budget many commentators threw doubt on the budget’s wage growth projection – to get to more than 3% – as likely to be too high. The report expresses concerns about the financial stability risks in the housing market in Sydney and Melbourne. Bowen said the budget showed new record debt for the next three years, a deficit for 2017-18 which was 10 times larger than was predicted in the Coalition’s first budget, and gross debt equivalent to A$20,000 for every man, woman and child in the country.